Philip Zec (1909-83) made such a name for himself as a political cartoonist and journalist in the fight against Nazism that he was earmarked for immediate arrest in the event of a German invasion of the UK. It is even argued that his VE-Day cartoon for the Daily Mirror was so influential that it proved a key factor in the 1945 general election that swept Winston Churchill from power. However, Zec had already established a reputation in his first chosen career as a commercial artist in the advertising industry, having won a scholarship to Martin’s School of Art at the age of just 13. Establishing his own commercial art studio at the age of 19, an early commission was this celebrated design for the night train to Scotland in 1932, combining a strong sense of adventure and excitement with dynamism and efficiency in its graphic detail. 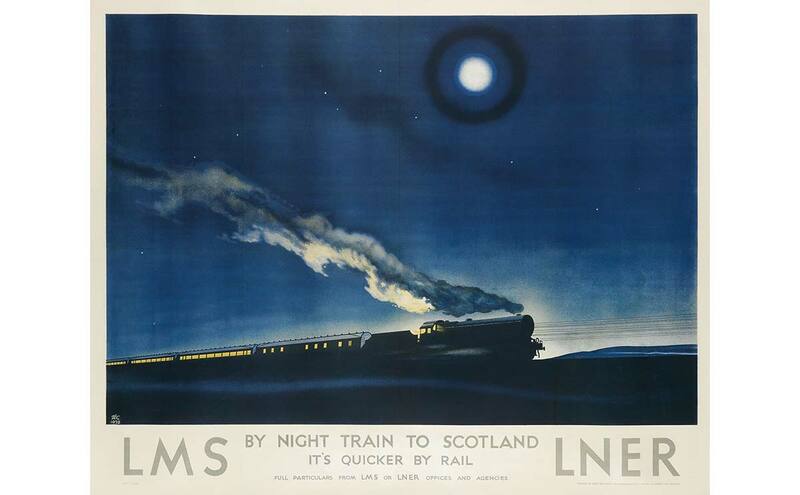 LMS/By Night Train to Scotland is now one of the highlights for the Rare & Important Travel Posters sale at Swann Auction Galleries in New York on 25th October. The estimate is $12,000 to $18,000.